At Russell Westbrook Hyundai of Anaheim, one of our goals is to keep our consumers up-to-date about our models so that they can make an informed purchase. If you want a crossover SUV, the Hyundai Santa Fe is an exceptional model. The Santa Fe comes well-equipped with a number of features, which include innovative safety features. Let's check out a few below. Rear Occupant Alert is available with the Santa Fe. This feature uses an ultrasonic sensor to monitor for children and pets in the rear seat. Before you exit the SUV, you will be sent a reminder to check for valuables in the rear. If motion is detected after you have exited and locked the Santa Fe, the system will sound the horn and send you an alert on your smartphone. The Santa Fe comes standard with the Safe Exit Assist System. This system provides your passengers with ample safety by monitoring for cars that are approaching from the rear. 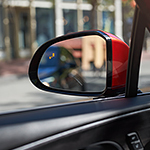 If a passenger opens the door when a vehicle is approaching, the Safe Exit Assist System will issue a visual and audible alert.